Greetings from the Persian Gulf! Recently I was looking at a world map, on which I usually place myself somewhere in the middle of that continent on the left. But whoops! I am suddenly all the way over there . . . 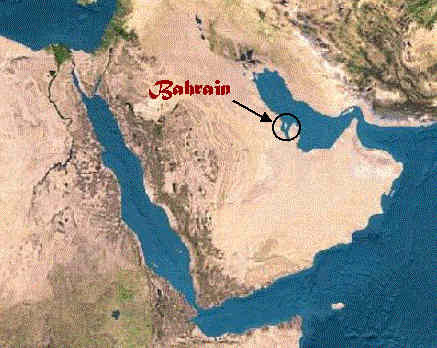 I am in Bahrain, a small island country tucked in next to Saudi Arabia on the Persian Gulf (called here the "Arabian Gulf"). This is the first of three three-week trips I am taking to help a manufacturing company develop a new computer system. The new system will help manage a plant for producing aluminum sheets. 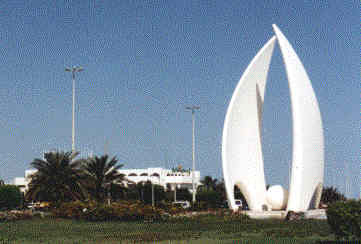 Bahrain is much more liberal than most Arabic countries, since it has a long history (about 5,000 years) as a trading center between east and west, and is accustomed to having many people here from many cultures. This means, among other things, that you can drink alcohol (in your hotel, at least), and many men and women wear western clothes. It represents a kind of escape valve for the much more conservative Saudi Arabia, with many Saudis coming here to party. As I write this, I am sitting on the balcony of my hotel room, with my cigar and my pint of bitters (there is an English Pub right next to the elevator on the ground floor (not to be confused with the first floor in this part of the world)), feeling quite comfortable, thank you very much. I am effectively 57 hours ahead of Houston. Not only am I nine time zones to the east, but the "weekend" here is Thursday and Friday. This means that while it is 9:00 p.m. on "Friday" here, there it is only about noon on Wednesday in Houston. It’s about 70°F out, with clear skies. The temperature here has been mostly delightful since I got here, although they are having what for them is a regular monsoon. Almost every day it rains. A nice gentle rain, without much water, but rain, nonetheless. I can hear traffic from my balcony, here, along with the sounds of construction – even though it is after dark. They are building a convention center across the way. They are moving right along on that. They have added a floor this week. It’s been a while since I have been in a truly foreign country. (Western European countries aren’t really that foreign, after all.) I forgot what it feels like. The airport is very modern and the signs are good and there was a fellow from the hotel who met me without difficulty. But it was still strange. There were all these people walking around wearing sheets, and the odd soldier carrying an uzi. I know that I am welcome and everything is fine, but still . . . I have the first exotic stamp in my passport in over twenty years! Send mail to webhay@davehay.com with questions or comments about this essay.